•	If your home has a backwater valve installed, follow the manufacturer’s instructions for cleaning to ensure that it is functioning properly. •	Check your sump pump to make sure it is working properly. •	If your home or area is prone to flooding you may want to consider ensuring any valuables are up off of basement floors. Conditions may result in road flooding and/or ponding in low lying areas such as backyards and drainage areas. Residents should exercise caution around all bodies of water including near creeks, bridges, culverts and dams, and to keep children and pets away from bodies of water. Motorists should be cautious if driving on flooded roads. Please call 905-546-CITY to report sewer back-ups, flooding over roadways, fallen trees or debris in drainage ditches or culverts. the 2019/2020 Recycling & Waste Calendar along with 12 Blue trash tags will be mailed out over the next week. Your Green trash tags expire on March 29th and the new blue tags will start being used on April 1st. – Starting April 1, Leaf and yard waste including grass clippings will no longer be accepted in the green bin. Acceptable containers include a brown paper yard waste bag or an open top ridge reusable container marked with a yard waste sticker. A yard waste sticker is included in each Recycling & Waste Calendar Envelope. Residents can pick up additional stickers at City Hall or any Municipal Service Centre or Rec Centre. For more info visit http://www.hamilton.ca/yardwaste. The Glanbrook Municipal Service Centre is located at 4280 Binbrook Road. – Styrofoam containers and black plastic including take out trays, coffee cup lids and dark coloured flower pots are no longer accepted in the containers blue box. These items are garbage. Update: As of 1pm all City buildings & non essential city services are being closed due to increasingly inclement weather conditions. Contracted Waste collection is still progressing but slower than usual. Please be patient as delays may be pushed into Wednesday. Please be aware of the high winds as well and secure your recycling and waste containers before putting them to the curb. Also be advised that if today is your garbage day waste pickup could take longer than usual. Please be patient as collection may take place later than normal. Due to today’s freezing rain conditions, the City of Hamilton is advising residents that waste collection is progressing slower than usual. Residents are asked to be patient as their collection may take place later than normal. If your waste is not collected by 6 p.m. today, please bring it in and place it back at the curb before 7 a.m. tomorrow. The Accomodation Meeting at Bellmoore School that was scheduled for tonight (January 29) has been cancelled. The board will inform when new date is set. stay tuned for further information. 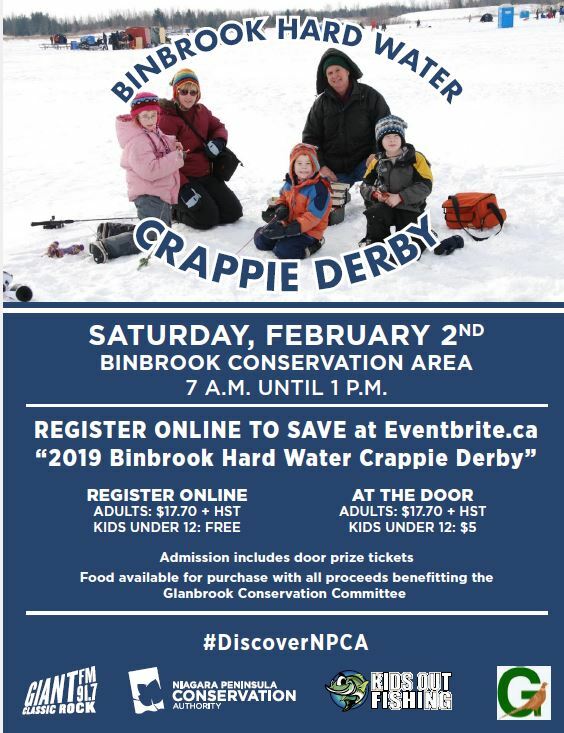 The annual Binbrook Conservation Area’s Hardwater Crappie Ice fishing derby is happening again this year on February 1st at the Binbrook Conservation Area. Tickets can be bought online or at the door. As the cold winter comes upon us, the de-icing smell from the Hamilton International Airport will rear it’s ugly head again. 3. Odour from indoors is the responsibility of the building owners, please investigate and have plumbing issues determined & fixed. The City of Hamilton wants to hear from you. We are looking for public feedback on private licensed retail cannabis stores in Hamilton. Please provide feedback about these establishments by completing the online survey between December 21 and January 9, 2018.